Taylor Made Sur-Moor T3C mooring buoys are offered in several sizes – from 12 inches to 30 inches – with each size available at Boatersland Discount Marine Supplies. These Sur-Moor buoys have a seamless and tough one-piece polyethylene shell. Hard skin shells feature ultraviolet light absorbers for long-term life under the sun. These mooring buoys are filled with EPS foam to positively displace water. Options are available to boaters as you can choose between hop-dipped galvanized eyebolt and swivel or tube-through-the-center design. Of course, the beauty of using mooring buoys for boaters is that they are more convenient than dropping an anchor. Also, with mooring buoys, you can be assured that your boat will stay where it is moored and will not collide with neighboring boats that are also on buoys. The sole purpose of the mooring buoy is to support the mooring chain. Both the eyebolt and swivel design and the tube-through-center buoy offer reliable floatation and will last for several seasons, depending on the salinity of the water. Freshwater applications will, of course, extend the useful life of any mooring system. 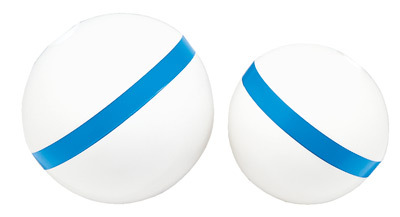 Once the type of buoy has been selected, the next question is selecting the proper size. Buoy floatation is measured according to the pounds of buoyancy that they provide. A buoy floatation rating is based on the amount of weight that it can suspend while remaining afloat just below the surface of the water. As a general rule, you should select a buoy that offers slightly more than twice the amount of floatation that is required for the weight or the anchor chain you will be using. As an example, 50 pounds of anchor chair will require a buoy with a floatation rating of slightly over 100 pounds. This ensures that the stripe appears above the water line. Note that the hardware for the Sur-Moor buoys at Boatersland Marine is sold separately. The hardware is available at low prices at Boatersland Marine.